Did you get anywhere with the plan to get ARP to make ones for Maney barrels? I'd love a set if you did ! Thanks for answering the question about the head gasket. I think that which ever way I go Jim Schmidt's long rods and light pistons will be essential to the exercise. Well, latest update is that a very large box has arrived at my house from Steve Maney containing the parts I mentioned in my initial post. Frustratingly however, I am 5,000 miles away. Did I mention that this is a tad frustrating? As a matter of fact, yes, sort of. 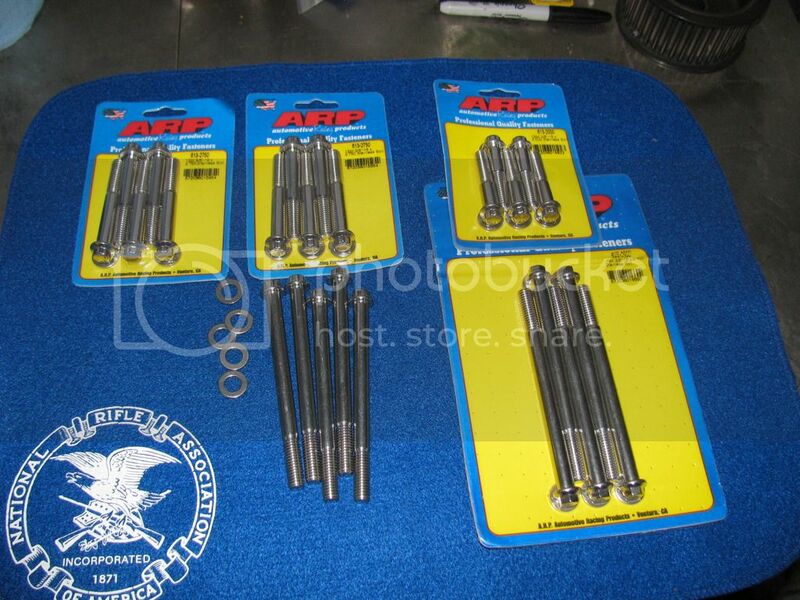 ARP has their high strength stainless bolts available in the correct sizes for Maney barrels and heads, almost. The ones for the through bolts need to be shortened just a bit, but should work fine, and I think I'll have to turn down the diameter of the flange slightly on the through bolts. The Maney cylinders take the stock size through bolts, so they will work for either stock or Maney engines. The head bolts are for the Maney cylinders only, as they are 3/8-16 thread. I have two sets in hand, one with slightly shorter cylinder through bolts to fit the 75 mm stroke 750 I'm building for racing, which has shorter cylinders to use stock length rods, and the other for standard height cylinders. As soon as I've checked to be positive the through bolts will work (I know the head bolts are right), I plan to box them up and ship them off to Jim Comstock to do his CNC waisting magic on them. I don't have a price yet from Jim, but the machining process is pretty time consuming, so they probably won't be real cheap. I'll drop by ARP and pick up another set to include to Jim, and if you still want them when they are finished, you can have them at my cost. If not, I still have another couple of Maney engines to build, so I'd be happy to keep them for my own use. Blimey, nice one Ken, you got that sorted pretty quickly! YES PLEASE... I will definitely take a set Ken. Mine has a stock barrel height. That's great to know this is sorted, its one of the thing that was on my mind to deal with, so thanks a lot! How do you know the stretch will be right ? Cos Sir Comnoz has already done the math, and more importantly, the road trials. If its good enough for his usage... its more than good enough for mine...! What has Jim already done ?? Tested the wasted head bolts. No, I was referring tongue in cheek to the math, or as we called it when I went to school, maths. Not to worry. Between an engineer at ARP and myself -the maths have been done. The "maths" for bolt design have been well known for a very long time now. This is not some new idea that we need to be nervous about. Waisted, or reduced shank, bolts would be a much more common design if it weren't for the fact that they cost more to produce. They are quite common in critical applications like high performance engines (head bolts, connecting rod bolts, main cap bolts, etc. ), aerospace, nuclear energy, and so on. You can find the engineering data in any number of books and reference papers about the design and use of fasteners. Comnoz is not reinventing the wheel, just making good use of it. I bought a supply of both viton and silicone. The silicone handles a higher temperature. The viton has a little better chemical resistance. KTM uses silicone o-rings at the head and I have reused them on my KTMs several times. So far I have only run silicone on the Nortons with good results. Normal head temp on a Norton would be pretty close to viton's max temp. 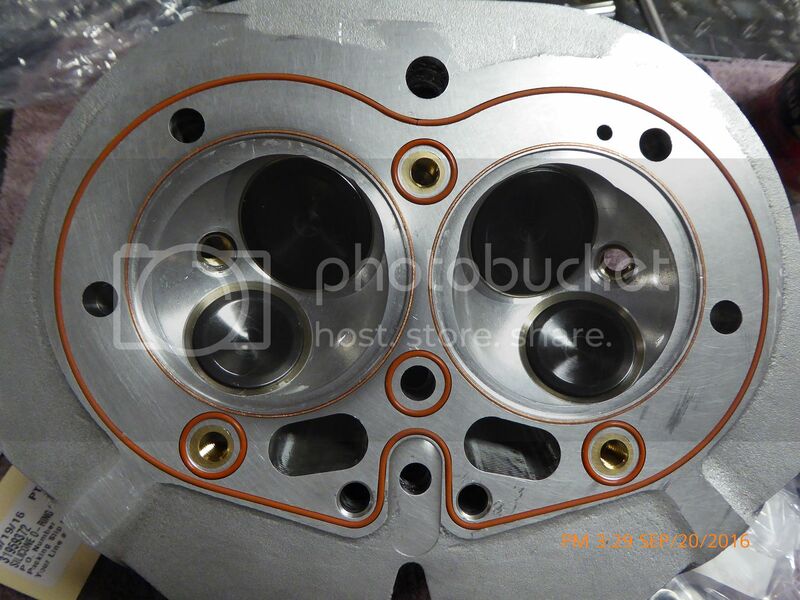 On the subject of head gaskets, I wonder if Jim Comstock is any closer to having Cometic 920 head gaskets made. If he doesn't read this I'll send him a PM. Cometic will only do them in copper without making a large investment for dies to make a multi-layer gasket. I have been doing the cylinder head o-rings which have been working excellent. No gasket- no leaks. With your gasketless head seal trickery, what is stopping oil seep from the pushrod tunnels, to the cylinder head bolt holes, and out to freedom? It looks to me that an o ring around the pushrod holes would be needed... I know I'm wrong cos you've proved it works! So can you tell me what I am missing...? In your first road test you did more miles than I'll do in a year! So are your trials with this set up are concluded? If so, are you going to offer kits? It would of course have been ideal for you to have modified my head to take the o rings whilst you had it, but we didn't know that at the time. Will you be willing to sell kits, along with clear machining instructions, so that folks like me on t'other side of the pond can use them? Phil Irving used waisted cylinder /cylinder head bolts in the series B and on Vincents (1947) . On a Vincent those 8 bolts attach the top of the engine to the crankcase and also hold the bike together. I generally live with a new development for at least 12,000 miles before I start offering it as a proven service. Up to that point I will do it with the understanding that it is still experimental. I was prepared to relieve the 4 outer thick head bolt washers and use o-rings between the washer and head if needed. So far no oil has shown up around the head bolts. When I installed the head I used a very light film of liquid Teflon sealant between the head and barrel. That may have provided the needed seal. Also there is likely to be firm contact between the barrel and head in the area around the head bolts. That probably helps. The o-rings are simply off the shelf rings and o-ring cord stock. .062 thickness. The copper rings are just .040 magnet wire with carefully cut ends butted together. I'm surprised to hear that the silicone o rings work on the KTM heads. I've always wanted to try orings on the head but my experience with the hot running Norts is that pure silicone will deform and take a set over time. It loses it tension and starts to leak unless you can keep tightening it up every 6 months or so. The harder silicons such as 90 durometer seem to work better and last longer but I don't think the 90 hard is available in orings. Hopefully it will won't leak after all that work. See the deformed 70 hard silicone below. Even if the silicon does work - it only makes sense to oring the pushrod tunnels and the oil return. Why oring anything else?????? Well, a bit of an update guys.